The Henderson Fire Department - consists of nine stations and has been divided into two battalions, Battalion 8 and Battalion 9, with three Battalion Chiefs each. There are approximately 60 personnel per shift. Each individual works a 56-hour work week on a 48-hour shift schedule. 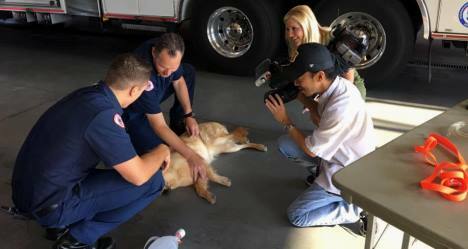 The City of Henderson Fire Department has the ability to respond to emergencies with nine Advanced Life Support Engine Companies, seven Advanced Life Support Ambulances/Rescues and two Truck Companies. Daily staffing of the Engine Companies consists of one Captain, one Engineer, one Firefighter and one Firefighter/Paramedic. Ambulances are staffed with a minimum of one Firefighter/Paramedic and one Firefighter. The primary duties of the division are fire suppression and the treatment and transportation of the sick and injured to the hospital. The Technical Rescue Team on each shift provides expertise on swift water, confined space, high angle, trench rescues, vehicle and heavy machinery extrication. A HazMat Team formed in 2014 provides response, detection and decontamination capabilities for incidents involving hazardous materials. 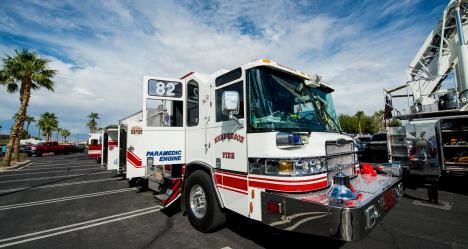 The City of Henderson Fire Department currently has seven transport-capable Paramedic Rescue units servicing the city 24 hours a day, each staffed with Firefighter/Paramedics. Nine Fire Engines, two Truck Companies, and one Heavy Rescue are equipped and staffed to provide first-response services from nine fire stations throughout the city. Each of the nine fire stations has an engine company staffed with Firefighter/Paramedics who provide advanced life support first response. The Truck Companies are also staffed with Firefighter/Paramedics and the Heavy Rescue is staffed with EMT-trained personnel. All emergency response units are equipped with defibrillators. All front-line Paramedic Rescue units are equipped with 12-lead EKG monitors.